Eliminates rotating of the display depending on the phone position. This option overrides system screen on/off settings. 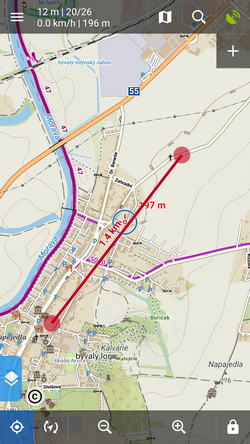 It is available in Locus Map Pro only. Defines situations when the screen is turned on/off by gestures or the app itself. 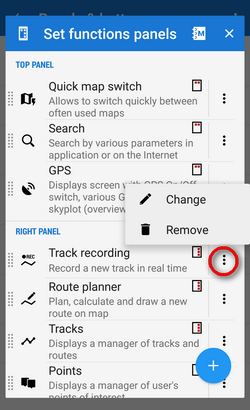 Turn on when notified on a track - Locus Map screen turns on when it notifies user of either next direction change or leaving the route he is being guided along. The option overrides system screen on/off setting but does not influence the settings made by the Screen on/off control feature. It is available only in Locus Map Pro. Basic screen lock - only basic phone lock (slider) that just prevents user from accidentally turning the device on is deactivated. If you have your device secured by a password, finger print or a gesture, you have to unlock it in order to work with Locus. All screen locks - password, finger print or gesture secured locks are also disabled for easy entering Locus. However, this setting may not work on some devices. Volume controlling hardware buttons can be used to zoom the map. Phones with hardware or Bluetooth keyboard can be also controlled by letters C - map centering, D - display, G - GPS, arrow buttons - map shift, +/- - zooming. Check if you prefer to disable rotation and panning of the map when pinch-zooming. (provided by Google, GraphHopper, MapQuest or Bing - can be set in Miscellaneous. 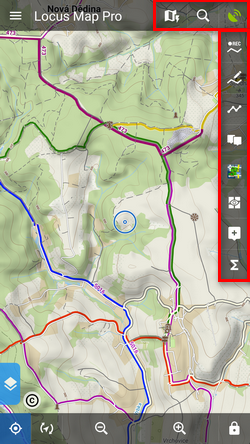 Here you can select set of location and tracking cursors, set their size or add your own. Sets association between speed and displayed map zooms. Bigger zooms for slow speeds and vice versa. Useful for navigation and guidance. Some categories are visible only when the content they represent is active, e.g. Active items or Map themes. Hides the top panel when inactive. Double tapping on the map displays it back provided the Map control style is set to Locus Map mode. Three-finger tap to display it if you use the Google mode. Hides the bottom panel when inactive. Double tapping on the map displays it back provided the Map control style is set to Locus Map mode. Three-finger tap to display it if you use the Google mode. Hides the right panel when inactive. Double tapping on the map displays it back provided the Map control style is set to Locus Map mode. Three-finger tap to display it if you use the Google mode. In case the panel hiding is on it sets the time interval before the panels slip in.